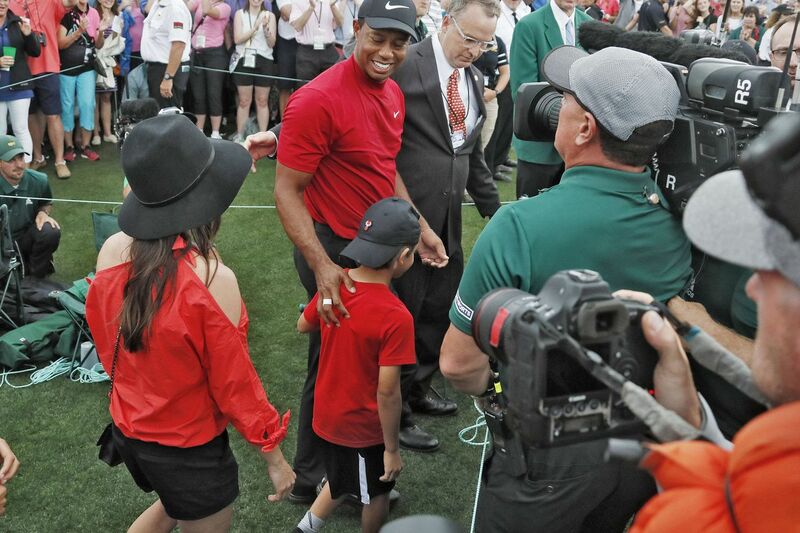 Tiger Woods smiles as he and his son, Charlie, walk off the course on Sunday at Augusta National. Woods completed his comeback from travails both personal and physical Sunday, winning his fifth Masters title an astonishing 14 years after his last. He is 43 and has been broken in so many ways. But this hug of Charlie, the ensuing embrace of his mother Kultida and then of Sam, it was both unprecedented and pure. When Woods won his 14 previous major championships — changing golf as he did so — his son wasn’t yet around; his daughter was less than a year old for the last. When he broke through for a historic 15th, they joined him, giddy, on a Sunday that reshaped golf again. Tiger Woods received his first green jacket in 1997, 22 years before he received his fifth. Tiger Woods pumps his fist in celebration in front of fans at the 18th hole.